Manufactured by the Swiss company Pilatus, the PC-12 is a six to nine seat turboprop engine comparable to the King Air 200 twin. 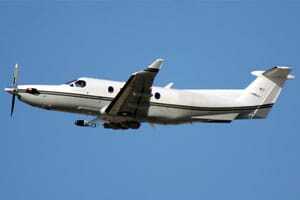 The PC-12 is the most popular pressurized single engine turbine powered aircraft in the world. It is so dependable that the U..S. Air Force employs them and has designated the plane U-28A. Since it came online in 2016, the PC-12 has had improvements in maximum takeoff weight, more powerful engines, new avionics, additional noise reduction features, speed and range enhancements, and much more. The PC-12 has earned its reputation as a reliable and flexible aircraft. 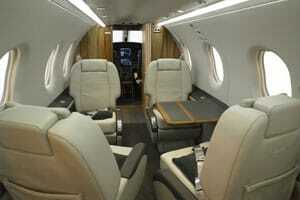 The PC-12’s roomy cabin can be arranged in several ways to fit customer needs. Up to eight executive seats can be grouped in double club configuration for in-flight business or rearranged for private rest. The cabin is equipped with fitted cabinets and tables. Should travelers require fewer seats and more space for cargo and luggage, combination arrangements can be set up by using available anchor points and cargo nets with the combi-conversion kit. Plus, the baggage area is accessible during flight. Our chartered Pilatus planes are staffed with two pilots for your added safety in flight.